An article in yesterday’s New York Times on General Motor’s use of social media to respond to its ongoing ignition switch crisis raises an interesting question: why, when the mainstream media, the company’s Facebook page and other online channels are full of complaints has its broader online reputation barely been impacted (according to data from Crimson Hexagon)? If you were in GM’s shoes, which would you regard as the more accurate and useful reflection of its corporate reputation at this tricky time: online reputation or mainstream media coverage (irrespective of concerns about the quality of social media sentiment data – though, to be fair, it is in my experience better than most at Crimson Hexagon)? Social media’s role as a real-time focus group of thousands sounds valuable and useful. Your online reputation, after all, is your reputation. Or so it is said. But whilst this is a nice marketing phrase, it is also highly misleading. Some stakeholder opinions are rarely voiced in social media. When was the last time you heard a high-level regulator actively discussing a company on Facebook? Ditto for pension fund managers or buy-side analysts on Twitter? The relative importance of different types of stakeholders varies over time. During its current recall crisis, GM’s core audiences will be the government, its customers and investors, and it is on them that it is most likely focused as an organisation. ‘Online reputation’ (however measured) is a reasonable and timely indicator of a firm’s broader reputation from a customer or general public perspective. But it should not be treated as an accurate or comprehensive reflection of the full range of views or, necessarily, of the relative importance of different stakeholders to that organisation, at any given time. In this regard, mainstream media is often a more useful gauge of non-customer stakeholder audiences, including government and business opinion-formers. Companies would do well to listen closely to both social and mainstream media for different if complementary reasons. Public relations is fifteen times (pdf) more effective than advertising. And at least 95% of public statements and PR pitches end up as email detritus, spiked by hard-pressed or incredulous journalists or funnelled down the black hole of news aggregation services. After all, much of the paraphernalia of today’s PR practitioners – press releases, media advisories, backgrounders – are carefully scripted, on message, and pour out of corporate offices and PR agencies like streams of confetti. Sounds like music to journalists’ ears. The reason, according to Alex Singleton in his new book The PR Masterclass, is that most PR pitches fail to understand the needs of journalists – story ideas that grab their readers’ attention. Singleton should know. A former journalist at The Daily Telegraph and Mail Online, he would have developed an instinct for what his readers were interested in, the kinds of stories that would grab their attention and what constitutes successful, and ineffective, PR. The PR Masterclass is studded with examples of good, bad and ugly PR, from a local tea blender on the south coast of England wooing the BBC by creating the world’s largest tea bag, to Whitehall departments refusing to pass on interview requests to their political bosses and a top global bank attempting to spin layoffs as ‘repositioning actions to reduce expenses’. For those of us who have worked in journalism much of this sounds familiar, a good deal of it depressingly familiar. But while this book is notable for the thoroughly practical way it sets out how to develop newsworthy story ideas, maintain a effective list of journalists, write and pitch press releases, run an effective press office and many other PR basics, what sets it apart is its refusal to succumb to the disease of many business books: a delight in pointing out what is challenging or wrong but providing all too few actionable solutions. And here the solutions are set out in technicolour detail. How to write a press release headline and build an effective media list. Why anonymous letters can work for personal finance sections of newspapers but not for general readers’ letters. Why most newswire services are a waste of money, but which are worth their salt. And so on. Arguably, The PR Masterclass suffers from a couple of limitations. First, it is written from an (unashamedly) western perspective. But while building strong relationships with journalists is central to PR anywhere, a well-trodden path to media coverage in China (and plenty of other emerging markets) is to pay the journalist and/or buy advertising space. The book also takes a fairly narrow view of PR, centred on media relations. Singleton argues persuasively that the conventional media still matters, despite all the talk about social media. But what constitutes mainstream media has now expanded significantly, with some blogs rivalling the online efforts of major broadcasters and newspapers. The Business Insider now has a higher readership than the Wall Street Journal. And as Ryan Holiday has pointed out, these organs can operate by very different rules and demand a muscular and visual approach to PR. Nonetheless, neither seriously detract from a highly readable and eminently useful addition to the PR canon, and one which should be required reading not just for communications students but for any organisation that wants to get its message out credibly and persuasively. It came as something of a shock. Arriving in Singapore from London in 2006 to run a global PR consultancy’s digital capabilities across Asia-Pacific, it quickly became clear that while digital marketing in the region was in rude health, corporate use of digital communications was often poor and sometimes non-existent. Budgets were small and the outlook mostly short-term. Many firms were struggling to understand the role and value of online PR. Key stakeholders were apparently not yet using Twitter. For companies, websites were Kings; email and search were its Queens and social media was but an Infant mewling about buzz and bloggers. Much progress has been made over the past few years, not least a broad realisation that a proactive approach to digital communications that includes social media is a must-have. And well it should be. Asians are some of the most mobile, networked and digitally-savvy individuals in the world. The world’s most social consumers in virtually every product category, Asians not only consume huge volumes of online content but also create more videos and other output than people in any other region. Equally, many Asians are increasingly aware of their rights as consumers and citizens and are prepared to take a public stand when they see these rights compromised. Negative product and service experiences are widely shared online, as firms such as Vodafone and Dolce & Gabbana have discovered to their cost. Civil society actors such as WALHI in Indonesia are using the Internet and word of mouth highly professionally to force change. Suddenly, the range of potential reputation red lights has expanded significantly. While there has been a flowering of company Facebook pages and Twitter and Weibo handles over recent years, there remains plenty to do if organisations are to fully leverage the benefits and limit the threats inherent in today’s digitised communications landscape. Concerns about what employees may say online. Education: While much traction for social media can be gained through trial and error, substantive progress is unlikely to be achieved without the buy-in of company leadership. Make a though and objective assessment of the broad range of opportunities and risks of social media and, if you don’t have one already, identify a strong and respected internal executive champion to establish ownership and authority, take responsibility for educating the CEO and other senior leaders, and to sell the vision. If that individual is in brand marketing or another function outside communications, make sure they are on your side and that you have a consistent vision. And whichever operating structure is chosen for digital/social media (centralised, de-centralised etc), ensure your team is actively playing its part and leveraging its known strengths: internal access and influence, external listening and engagement, management of corporate reputation. Budget: Budgetary support will increase as a result of leadership confidence and buy-in. Don’t get hamstrung just because there is not a standalone digital/social corporate communications budget or figure that social media should live in PR. Many firms now have dedicated social media teams that sit independently of communications; for instance, while social media resides within marketing at Ford, the Digital Acceleration team at Nestle owns social media and reports simultaneously to marketing and corporate communications. Beyond this, be clear what you are trying to achieve and report regularly using metrics that are relevant and understandable to top leadership. Behaviour: Increasingly, communications is seen to work in the long-term interests of a company’s reputation, providing it with a legitimate interest in ensuring sound employee behaviour. Accordingly, communications should work closely with other relevant areas of the business to identify and mitigate possible behavioural reputational risks, rather than simply having to manage them once they occur. Many organisations now have a corporate social media policy of some description that sets out the parameters of employee behaviour in social media, but few have successfully ensured that their people (as well as others within their ecosystem such as sales agents) fully understand and live by these documents. In my experience working both in in-house PR and as an external communications and social media consultant, the image of corporate communications can suffer by appearing too far removed from the realities of day-to-day life in the trenches. 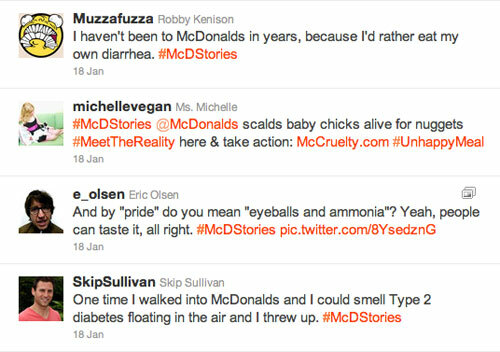 Social media makes managing reputation in real-time a company-wide prerogative. Corporate communicators must get into the trenches and fight the good fight. Being seen to do this will help accelerate digital as much as anything else. Economic uncertainty abounds, jobs for life have disappeared, companies gobble each other at the drop of a hat. Change may be a constant in many people’s working lives, yet most (70%, according to studies by John Kotter and McKinsey (pdf) – a figure since disputed) major change management programs fail. Failure to communicate effectively is one major reason and, according to a recent panel discussion of change communications specialists at the American Chamber of Commerce in Hong Kong, much of that failure is down to an over-emphasis on leadership communications and a lack of willingness to understand and act on employee concerns and motivations. Rather, the real key to successful change communications is for line managers to act as the primary change agents. Research studies show that employees trust their line managers much more than they trust senior management. The CEO town hall does not cut it when it comes to communicating major change. Yet even line managers have their work cut out, for employees trust their fellow colleagues more than their immediate bosses, something that is likely to have been deepened by the availability of social media within the workplace. Far from killing office water-cooler chat, social media has put employee word of mouth on steroids. How should organisations communicate with rank and file employees on social media during major change initiatives? Make sure to listen and respond quickly, openly and thoroughly. To square the circle, I would add that both company leaders and managers need to be actively involved in these conversations. Disclaimer: I chair the Chamber’s Communications & Marketing Committee that helped organise the session. Hell hath no fury like a customer scorned. Just ask British Gas, whose recent foray into social media via a Twitter Q&A using the #askBG hashtag to explain a 9.2% price hike met with undisguised contempt from its customers. True to form, the UK’s tabloid press and other media were only too happy to record in excruciating detail the live public dismemberment of BG’s corporate carcass on social media. Much has already been said about how BG could better have handled the conversation, notably that it should have been better prepared to respond to the wide range of questions and allegations thrown its way. Quite so, but while this sounds fine in principle it can be tricky to achieve in practice. 16,000 tweets is a lot for any organisation to cope with. One option would have been for BG to have fronted a team of executives from different parts of the business rather than a single customer services spokesman. Not only would this have created far greater response capacity, it would also have enabled the responses to be more helpful, insightful and authoritative. 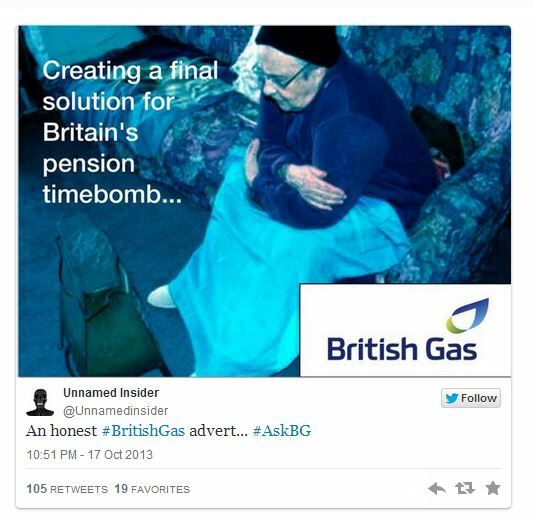 Yet fielding a bigger team may not have been necessary had British Gas thought more carefully about its hashtag. 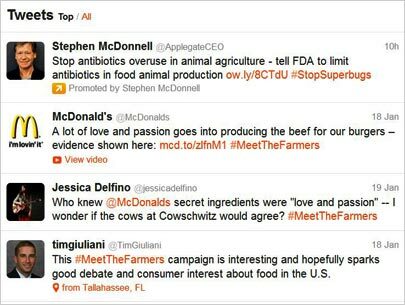 As we saw with McDonald’s infamous #McDstories (spectacular backfire) and #Meetthefarmers (neutral to negative reaction) sponsored promotions, the broader a discussion is cast, the more likely people are to talk about things you may not expect or want them to. By choosing a hashtag explicitly related to the issue at hand, BG would have had a better chance to contain the parameters of the discussion and shape its outcome. Of course, the bigger question is whether BG should have hosted a Twitter Q&A in the first place. With a reputation for unwarranted price hikes and third-rate customer service, there was always a risk that a public discussion on a highly topical, contentious and political topic hosted on a channel tracked by ranks of Tweetdeck ogling journalists could go astray.